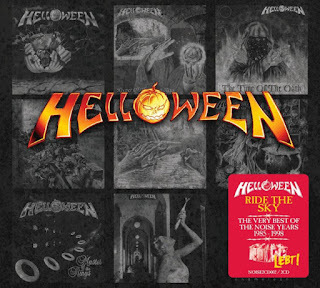 The image of Helloween would, for many, always be beset by cartoon pumpkins and odd musical turns did not exactly help, however Disc 1, is a musical triumph- cracking material treading the line between power, speed and trad metal with no small amount of charm and a ton of ability. The second disc has a staggering 11 fine tracks out of 14! So if you like power/trad metal, then this two disc set comes as a timely reminder that German metal is not all about Teutonic thrash. An excellent compilation which is well worth checking out. Going back to their early days, Helloween were, I suppose, a power metal band who bordered on the realms of thrash. Perhaps this would have been speed metal at that time, a term which fell out of favour or just merged with thrash. Certainly, their early work is MUCH heavier than you might expect. It is by turns, pacey, melodic, well played and distinctly Germanic in its practised efficiency. Kicking things off with “Oernst of Life” (an obscurity I think, as I do not recognise it from their first releases...). “Metal Invaders” follows and the band proves that they were no slouches in the tempo department. Simply put, I like the early Helloween material a lot. It is essentially a revved up version of early Iron Maiden, albeit without the lyrical themes and street credibility. The other tracks from “Walls of Jericho” hold up well; “Murderer”, “Ride The Sky”, as does “Starlight” from their debut EP. The production on this era's material does just fine also; it is surprisingly good, even, coming out of the gates with Accept-like energy and possessing a similar metallic sound to that band's work. The band play tight and fast, easily on a par with what the US was throwing out at the time and streets ahead of well worn British offerings who tried to emulate the Yanks with only fleeting success (for the most part). The bombast and aggression of the band's nascent recordings would not really last, though, and things took a different path for the next record. If that sentence implied some kind of impending wrong turn, then I gave a false impression. “Keeper of The Seven Keys Parts 1 and 2” (“Part 1” in particular) are hailed as genre classics and with good reason. Strangely, Kai Hansen switched to guitar only to make way for Michael Kiske on lead vocals- who made his presence felt with his high pitched wails and clean delivery. Michael Weiketh, sadly, could not play on “Part 1” due to an injury, so Hansen picked up the slack masterfully. “Keeper...” then, is the first and possibly best example of the power metal sound. Fast and technical with lots of triumphant melody, but underpinned by a rock solid foundation of blazing bass drums and lightning strike guitar. Certainly, the difference between the grit of “Murderer” and “I'm Alive” is pronounced. Tracks such as “Future World” represent a kind of Iron Maiden like metal without the darkness or street themes of Maiden's early work. Helloween, instead, went for pure fantasy- from the album cover to the themes contained therein, this was fantasy metal, one for the Warhammer warriors and readers of Lord of The Rings. Truthfully, “Part 2” was an inferior record. The likes of “Eagle Fly Free” are reliably speedy, but the echoey snare sound and slight dip in quality control meant that the record seemed a little out of focus. The catchy “Dr Stein” is also ludicrous and would condemn Helloween to the realms of comic book metal for many fans. Cracking solo, though. That said it is still a very good album- “I Want Out” features here and is just one of many highlights. The image of Helloween would, for many, always be beset by cartoon pumpkins and odd musical turns did not exactly help. Disc 1, then, is a musical triumph- cracking material treading the line between power, speed and trad metal with no small amount of charm and a ton of ability. On to disc 2, then... I will start by saying that my knowledge of the band really does stop at “Keep...Part 2”. “Pink Bubbles Go Ape” was the studio follow up from 1991 and was very poorly received at the time. Perhaps this is unfair- “Kids of The Century” is a cracking melodic metal track. However, gone were the fantasy themes and the replacement themes involving streets (fine) and “Heavy Metal Hamsters” (not fine and not included here) saw the band lose their way. 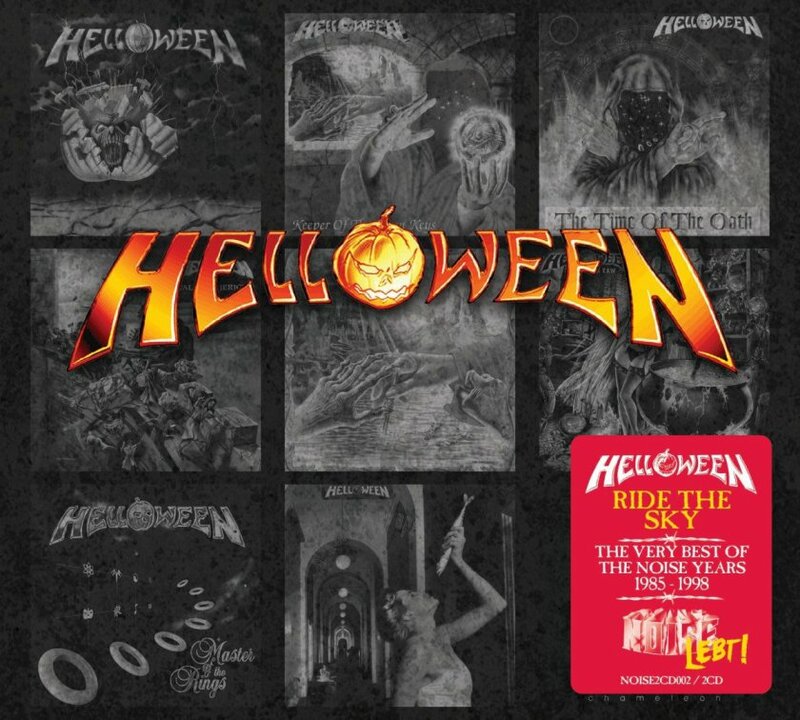 The less said about the horrible synths of “Step Out of Hell”, the better- by the time of “Chamelon” in 1993, the band were operating in the kind of between genre mire of so many other successful metal bands of the 80's. However, while those bands aped the grunge approach of the day, Helloween seemed content to ape Status Quo. The kindest thing that can really be said about the material from the band's two early 90's albums is that it was very well played and, to be fair, well produced. It was just completely incongruous with the band's history and approach. “Master Of The Rings” is well represented here, then with “Where The Rain Grows” taking the band back to their earlier power metal sound and themes and doing a very fine job of it. Drummer Ingo Schwichtenburg was gone- sadly never to return as his untimely death put paid to any possibility of that; a huge shame as he was a force to be reckoned with behind the kit and had imbued the band's first few albums with a sense of urgency and energy as only a good drummer can. “The Time of The Oath” continued the band's renaissance and tracks like “Steel Tormentor” and “Power” are really very good indeed- in fact, listening to the band in the mid 90's really makes me want to get hold of the albums in full. This is good stuff and PROPER metal. Hard to find in that era, as it was all but ignored by the press of the day. “Better Than Raw” from 1998 is the final record to be represented here- again, the material is well played, well written and well produced. It is also COMPLETELY out of step with what else was going on in the late 90s. “Time” and “I Can” are throwbacks to a different musical era and this only gives me more respect for the band. Over the two discs, it is only three songs (from PBGO and Chameleon) that let the side down at all. The first disc is wall to wall classic material. The second disc has a staggering 11 fine tracks out of 14! Helloween, then, have been rather overlooked by me. Unfairly, as it turns out. If you don't like power/trad metal then Helloween might persuade you otherwise. If you do, then this two disc set comes as a timely reminder that German metal is not all about Teutonic thrash. An excellent compilation which is well worth checking out.